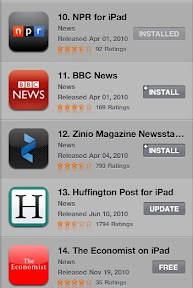 Apple has quietly made recent changes to the App store that are welcomed for the user experience. They now have an "Install" button on apps that have either been purchased previously or apps that have previously been downloaded. This helps to identify apps that are owned. Previously, apps that were owned were not identified at all. If an app was previously owned, but it wasn't loaded to your device, the app would display the "buy" button after clicking the price button. My owned apps used to be handled as if the apps weren't owned at all. The buy button would have to be clicked before the store would display the "you already own this app" moniker. This contextual addition is what is expected of a smart device. I have purchased apps unintentionally because they were either not universal apps or the app name was closely named to one I owned, but wasn't exactly the right app. Every time I clicked the "buy" button, I would hold my breathe. This is no longer necessary. Apple also include an “Update” button for when an app has an update. This is not as necessary because there is an update tab that identifies apps that require an update. If you have a huge library of apps installed on your device, and you’re not very diligent about checking for updates, this could come in handy as you are browsing the apps. The filters that Apple added were the most useful. They appear along the top of the results returned when you enter a term and hit the search button. Filter categories include Category, Release Date, Customer Rating, Price and Device, and there’s a final option that allows you to reset them all. 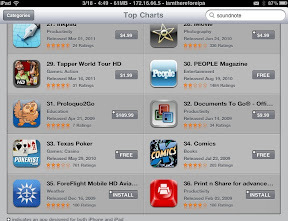 I wrote about is back in February in the article: Apple adds Filter Search to App Store on iPad. I am still waiting for the ability to see all of my purchases from the App store, while I am in the App store. I should be able to see all apps that are considered "mine". I also would like to filter all of the free apps and all of the apps that I have paid money for. I also would like to see the price of the apps I have installed. Sometimes I am asked about an app and I try to tell someone else what the price is only to able to do so. So my list of apps, should show the price I paid as well as the current price of the app.